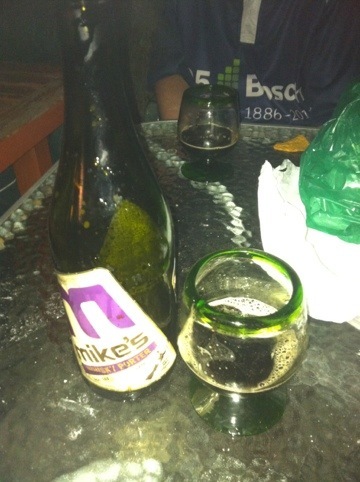 Mike’s Whisky Porter is, as the name suggests, a Porter style beer infused with Whisky and aged in oak Whisky barrels. This process imparts it with the distinct peaty characters you would expect; and at 10.5% it’s best shared with friends. Dark, almost black, thick pour, hint of whiskey on the nose, wisps of bubbly tan head. Smooth on the tongue and filled with complex whisky characters. Chris: Tastes like those liquor chocolates that you used to get in the 80s! Phil: Creamy smoothness with a sting of whiskey. When it’s gone you’re left with a lingering, smokey whisky finish with a distinct oak character. IN SUMMATION: We all agreed this was one delicious and complex beer, which gives you something new on each mouthful. Definitely one to try. This brew is infused with peruvian coffee beans. Again it is almost black with a frothy tan head. To me, it smelled and tasted like cheap ground coffee, the kind your mum uses in a filter machine – slightly bitter, stale and not terribly pleasant – and I swear it smelt freezer burned too… To me the flavour was not like “coffee” but like ground coffee beans in cold water. Which makes sense, since that’s basically what it is, but not my cup of Jo. Josh sided with me on this one (he hates coffee anyway), where Steve and Phil had mixed opinions and weren’t too fussed either way.